Cooking has never been so much fun! 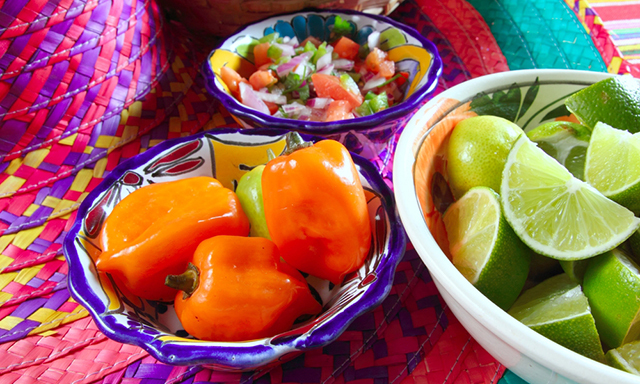 Enjoy a hands-on culinary experience, as two dancing chefs teach you how to make a variety of authentic salsas and perfect your margarita making skills. Create, eat, and drink a variety of Mexican dishes including a fiery red salsa, oaxacan guacamole, pico de gallo, and tasty cheese quesadillas. Once you have mastered these Mexican culinary skills, you will have the choice to relax on the beach and enjoy the stunning views, dive into the pool, or snorkel the crystal waters. • Culinary Creations: Create a variety of authentic salsas and two margaritas while swaying to soulful sounds of salsa music. • Snacks: Enjoy tasty cheese quesadillas, crispy taquitos, and handmade tortillas chips. • Beach Break: Relax on the beach, enjoy one of the hotel's pools, or rent snorkel gear. • Ground transportation is provided to and from ship. Lockers and towels are also available for an optional fee. Aquatic activities are not included. • Guests must be of legal drinking age to participate in certain components of tour. Guests must be at least 5 years old and accompanied by an adult. • Guests must consider their physical fitness level and medical history when determining whether this tour is appropriate. • Guests with cardiac conditions, asthma, diabetes, epilepsy, other heart or respiratory conditions or any other medical condition must take particular caution when selecting a tour with snorkeling/swimming elements, since such water activities could be subject to adverse sea conditions such as high winds, waves, and sea current. • Guests who have concerns must consult with their personal physician before engaging in any activity that may be strenuous for them, particularly those involving snorkeling/swimming elements.